Rendezvous on Champs-Elysees... Leave Paris in the morning on T.E.E. In Vienna we sit in a late-night café... Straight connection, T.E.E. Why is Rail Worth Saving? What Has Gone Wrong and Why? Europe has long benefitted from a dense rail network, including many cross-border routes that have traditionally been operated in a spirit of cooperation between neighbouring national railway companies. Today, however, the passenger rail network as a whole is slowly contracting, including the loss of both regional cross-border and direct long-distance international routes. Cross-border trains are under particular threat for a variety of reasons, including lower demand and higher operating costs (than equivalent domestic routes), poor management and domestic and EU-level politics, compounded by the economic crisis. In recent years passengers have faced line closures, timetable cuts (including the loss of direct long-distance trains), poor connections, ticketing difficulties and insufficient information provision, prompting World Carfree Network to launch Back on Track at the end of 2012. Our aim is to raise awareness of cross-border rail problems, highlight solutions and encourage positive intervention at the national and European levels, while supporting other groups with their own regional pro-rail campaigns. 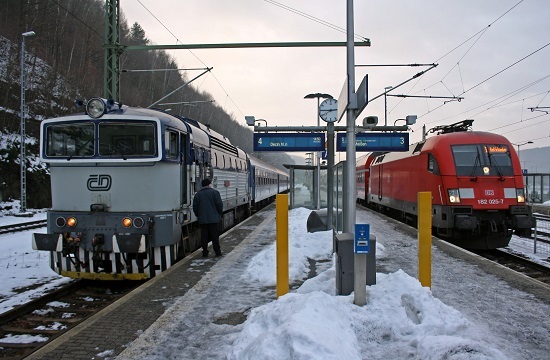 Austria - Germany: direct trains between Vienna and Berlin are restored in the form of both an ICE train pair via Nuremberg and a daily night train via Bohumín and Wrocław. Austria - Hungary: an additional Vienna - Budapest train pair is provided, meaning the fast, direct service between these two capitals now runs almost hourly all day, with just two gaps left to fill. Austria - Italy: MICOTRA services between Villach and Udine were extended to/from Trieste at weekends from 2 June 2018. Funding is in place for these services to continue until at least June 2019. - a new daily night train service links Vienna with Wrocław, Zielona Gora and Rzepin. - from 13 April 2019 one EuroCity train pair between Vienna and Warsaw conveys through carriages to/from Kraków. Austria - Romania: a new direct service links Vienna and Cluj Napoca via Budapest and Oradea, formed by extending an existing Budapest - Cluj Napoca train pair. This reduces the journey time to/from Vienna by an hour - more of this please! Austria - Slovenia: four new regional train pairs link Villach and Jesenice on weekends between June and September, a welcome addition to the otherwise poor service of just five long-distance train pairs on this international main line. - a modest service of two new daily train pairs links Charleroi-Sud with Mauberge, connecting into/out of intercity trains to/from Paris. These are the first passenger trains to use the Erquellines - Jeumont border crossing since September 2012. - a modest service of two new daily train pairs links Mons with Aulnoye, connecting into/out of intercity trains to/from Paris. This restores passenger services to the Quevy - Feignies border for the first time in ten years. Belgium - Germany: from 7 April 2019 the midday train pair Brussels - Cologne - Frankfurt will run daily instead of only on Fridays and Sundays. Also new on this route on Sundays from the same date until 3 November 2019 is an additional late evening train pair. Czech Republic - Germany: Prague - Munich trains are accelerated by 10-15 minutes thanks to track upgrades in the Czech Republic. 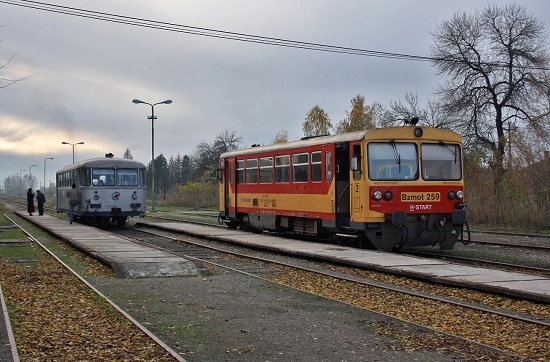 - a daily service is launched between Trutnov/Královec and Lubawka/Kamienna Góra/Sędzisław (for connections to/from Jelenia Góra), the first weekday cross-border trains on this route for 69 years. There should be seven train pairs on weekdays, four at weekends. - a new night train links Breclav and Bohumín with Wrocław, Zielona Góra and Rzepin. - an existing Vienna - Břeclav - Bohumín - Warsaw EuroCity train pair conveys through carriages to/from Kraków from 13 April 2019 onwards. - an existing Budapest - Břeclav - Bohumín - Warsaw EuroCity train pair conveys through carriages to/from Kraków. - we understand the twice-weekly Leo Express train pair between Prague and Kraków introduced in July 2018 will continue to operate. - a new late EuroCity connection runs from Bratislava to Prague. - night trains between Prague and Košice are accelerated. France - Germany: the Paris - Freiburg im Breisgau TGV train pair is improved to run daily and accelerated by about 45 mins thanks to taking the shorter route via Offenburg. - the night train Paris � Cerbère - Port-Bou was partially reprieved in summer 2017 thanks to regional financing; in 2019 it will run at weekends all year and daily during school holidays. - the night train Sud-Express in the direction Ir�n to Lisbon was extended to start back in Hendaye, France, from 25 April 2018, a common-sense move that makes rail journey opportunities from France to Portugal visible, bookable and much easier to make. This arrangement continues throughout 2019. France - Switzerland: although the cross-border section Delle - Bonfort reopened to passenger trains in 2006, it has taken another 12 years to reconnect Delle with the rest of the French rail network in the form of a new service of up to 16 train pairs per day linking Belfort and Delle directly or with a change in Meroux. The cross-border service itself is provided by Swiss rolling stock, with hourly trains from Biel/Bienne reaching Delle or Meroux. Germany - Great Britain: new journey opportunities arise as a result of improved connections between ICE and Eurostar trains in Brussels, made possible through additional ICEs (see Belgium - Germany above), the reduction of the minimum interchange time in Brussels to 14 minutes (towards Germany) and the putting back of the last Eurostar from Brussels to London from 19:52 to 20:22 daily. Germany - Netherlands: a new hourly direct service operates between Aachen and Maastricht via Herzogenrath and Heerlen, made possible by the electrification of the Herzogenrath - Heerlen section and use of multi-system electric multiple unit rolling stock. This replaces the former EURegio service that ran from Aachen as far as Heerlen. Germany - Poland: a new direct night train service links Berlin with Kraków and Przemysl (close to the border with Ukraine). This also creates a late evening (eastbound) and early morning (westbound) direct connection between Berlin and Wrocław via Rzepin and Zielona Góra. Germany - Slovakia - Hungary: a direct night train service linking Berlin with Bratislava and Budapest is restored after an absence of one year, this time running via Frankfurt (Oder) (DE), Wrocław (PL) and Bohumín (CZ). Great Britain - Netherlands: new journey opportunities arise as a result of improved connections between ICE and Eurostar trains in Brussels, made possible through additional ICEs (see Belgium - Germany above), the reduction of the minimum interchange time in Brussels to 14 minutes (towards Germany) and the putting back of the last Eurostar from Brussels to London from 19:52 to 20:22 daily. Hungary - Poland: an existing Budapest - Břeclav - Bohumín - Warsaw EuroCity train pair conveys through carriages to/from Kraków. Italy - Slovenia: two daily train pairs between Trieste and Ljubljana were launched on 9 September 2018. These services continue in 2019. Poland - Slovakia: an existing (Budapest -) Bratislava - Bohumín - Warsaw EuroCity train pair conveys through carriages to/from Kraków. Slovakia - Switzerland: an existing Vienna - Zürich RailJet train pair is extended to start back from/run to Bratislava, creating the first direct connection between Bratislava, western Austria and Zürich for many years. In this section we highlight massive infrastructure investments that have somehow not led to the service improvements one woud expect. Germany - Poland: there will be no passenger trains via the Horka - Wegliniec border crossing, which reopens in December 2018, despite its reconstruction for 160 km/h and electrification. One reason for this is the remaining gap in the electrified netwok between Cottbus, Horka and Görlitz, the 'natural' route for passenger trains between (Berlin), Cottbus and Wrocław. Lithuania - Poland: as part of the Rail Baltica project linking the north of Poland with Vilnius, Riga and Tallinn, new standard gauge tracks between the PL/LI border and Kaunas (LT) were opened in 2015. Instead of the immediate reinstatement of a service at least as attractive as the one that existed until September 2013 (but preferably much better than a single daily train pair! ), there were instead no trains at all until a weekends-only service between Kaunas and Białystok commenced on 17 June 2017, taking around 4 hours 40 minutes to cover the 250 km! The much-awaited new Mockava - Białystok - Warsaw - Kraków TLK train pair was announced as starting in December 2015 but has to date not run at all. When will this much-needed service finally begin...? France - Netherlands: Thalys trains between Lille and Rotterdam/Amsterdam are withdrawn. 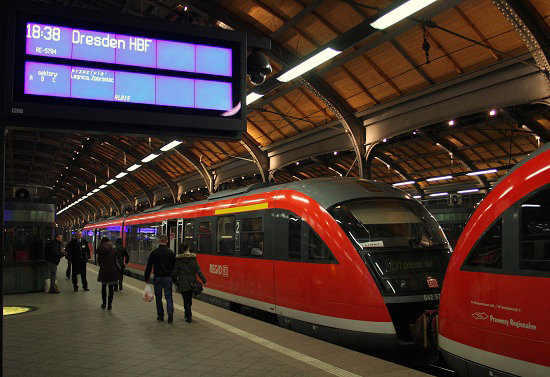 Germany - Poland: the three pairs of Dresden - Wrocław regional trains are cut back to operate between Dresden and Węgliniec for onward connections to/from Wrocław. Germany - Switzerland: the EuroCity service between Munich and Zürich is reduced from four to three daily train pairs. Greece - (North) Macedonia - Serbia: trains have not run between Thessaloniki and Gevgelija (North Macedonia) since 17 October 2017, but the single train pair was at least replaced by buses provided by TrainOSE. However, the bus ceased operating on 30 September 2018, while the entire remaining route of the train (a single daily night train pair between Gevgelija/Skopje and Belgrade) has been "temporarily suspended" since 1 October 2018. It appears that Greece and (North) Macedonia will have no international passenger trains in 2019. What is going on in this part of the world...? Hungary - Serbia: it appears that Budapest - Belgrade services will be suspended from 1 February 3029 owing to track rebuilding in Serbia. Knowing this part of the world, it is to be expected that trains will be neither diverted via non-electrified alternative routes nor replaced by buses. (North) Macedonia - Kosovo: it is reported that as of October 2018 the Skopje - Han i Elezit (- Pristina) train pair is 'temporarily suspended' without bus replacement. There are no signs that this situation will change in 2019. Norway - Sweden: the Oslo - Stockholm service of up to two daily train pairs (cut back from 4-5 to 1-2 from mid 2018) is decelerated by 30 minutes owing to long-term engineering work. In this section we list countries that are completely cut off from their neighbours, i.e. countries with rail networks but no international passenger trains at all. Albania: this country has never been served by international pasenger trains despite the existence since 1986 of a line between Shkodër and Podgorica (Montenegro), used by freight trains. Bosnia: no international trains since the withdrawal of the Sarajevo - Zagreb train pair in December 2016. Greece: trains have not run between Gevgelija (Macedonia) and Thessaloniki since 17 October 2017, but the single train pair was at least replaced by buses. However, even the bus has not operated since 1 October 2018! Over on the border crossing between Greece and Bulgaria, trains ceased between Strimon and General Todorov on 25 May 2017. A replacement bus has operated since then, seemingly linked to the decision of TrainOSE to use non-standard rolling stock on the Thessaloniki - Alexandroupolis service, which can therefore no longer convey through carriages to/from Sofia. (North) Macedonia: The Belgrade - Niš - Skopje - Gevgelija night train pair ceased on 30 September 2018. Similarly, it is reported that as of October 2018 the Skopje - Han i Elezit (- Pristina) train pair is 'temporarily suspended' without bus replacement. All this means the country is no longer reachable from its neighbours, just as it appears to be on the verge of improving political relations with Greece. Trains can offer safe, fast and low-carbon mobility for all, reducing the environmental impact of travel significantly. On average, rail produces only 25% and 30% of the per passenger km carbon emissions of planes and cars respectively, based on average occupancy figures. These figures do not include the additional climate change impacts of emissions at altitude: aviation figures should be multiplied by a 'radiative forcing index' of between 1.9 and 2.7. Note also that GHG emissions from rail are even lower in countries with a high proportion of renewable electricity generation, including Sweden and Switzerland with their abundant hydro-electric power and almost zero-carbon rail operations. Trains offer direct city centre to city centre travel and allow passengers to use their on-board time productively. 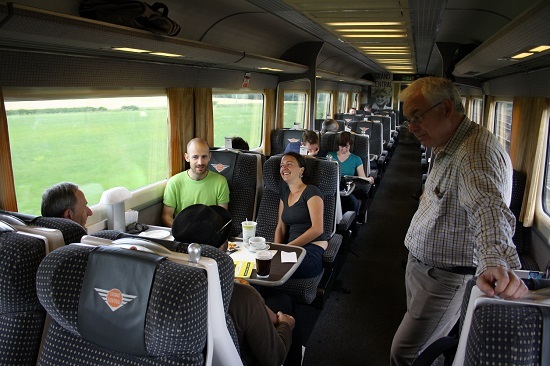 Many people simply enjoy the experience of watching Europe passing their window seat... we often wonder why most railway companies do not follow the lead of Switzerland in actively promoting the comfort and pleasure of rail travel! Towards Carfree Cities IX conference participants enjoy a networking opportunity en route from York to a study tour in Newcastle, courtesy of Grand Central. Although this company is a private 'open access' operator, ticketing is integrated into Britain's national system: we regard this as both passenger-friendly and a sensible long-term business model. Without railways, there would be many more cars and trucks on Europe's roads, leading to increased congestion, air pollution, fossil fuel consumption, reliance on energy imported from politically unstable parts of the world, noise and accidents (9 people die every day on British roads, considered to be among the safest in the EU). Without Europe's dense network of passenger train routes, how would you get around? Would you buy a car, fly more and/or suffer slow long-distance bus journeys? Or hitchhike...? Would your want to live in your city if it becomes overrun with even more motor vehicles? European and national transport policy favours aviation. Flight tickets and aviation fuel remain largely untaxed, representing a huge subsidy and making it very difficult for rail to compete on price. In the early 1990s German and Swedish Railways cooperated in the operation of three daily train pairs between Prague/Dresden/Berlin and Malmö in Sweden. Thanks to the European Commission's liberalisation of aviation, the train became unable to compete with undertaxed low-cost flights on price. A vicious circle of falling passenger numbers and service cuts followed, culminating in first DB, then SJ, pulling out of its operation. 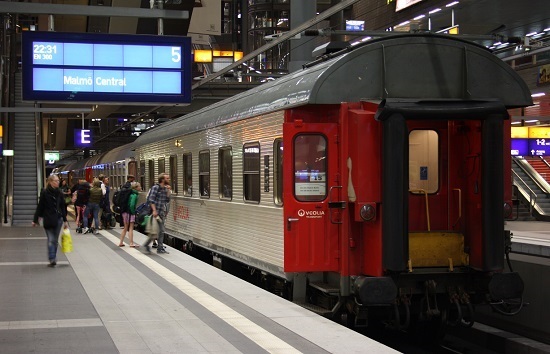 Since being taken over by the private operators Veolia and GVG in 2012, the remaining Berlin - Malmö service runs 2-3 times per week and without sleeping cars in the short Swedish high summer only. We are of course grateful to the operator for continuing to participate in the InterRail scheme, one of very few 'open access' operators to do so. European and national transport policy favours road transport. The European Commission and national governments continue to drag their heels over the implementation of �user pays� and �polluter pays� principles for private car use, putting rail at a competitive disadvantage. The road freight industry covers only 60% of the environmental and infrastructure damage it causes, representing another perverse subsidy, while around two thirds of trucks are operated illegally in some way (exceedance of maximum permitted driving hours, overloading, etc). Maximum permitted truck weights continue to be raised across the EU, the Commission having somehow been persuaded by the road haulage lobby that 'supertrucks' will lead to fewer truck movements! Of course it does no such thing and simply undermines the economic viability of rail freight, especially the 'wagonload' market. If rail freight disappears from a particular route, passenger trains then have to bear all the infrastructure maintenance costs. A Rijeka (Croatia) - Ljubljana (Slovenia) - Vienna (Austria) train climbs out of Rijeka in October 2012. Croatian Railways (HZ) announced that the entire Croatian section of the route would lose its passenger trains in December 2012, on the eve of the country's accession to the EU, but WCN's petition helped to persuade HZ to reverse this decision. Within Croatia this line is extremely slow, raising questions as to why speeds were not increased during recent (EU co-financed) work to change the electrification system. In contrast, the parallel road has been lavishly upgraded, undermining the economic viability of the railway. Such scenes can be seen across vast swathes of central and southern Europe. 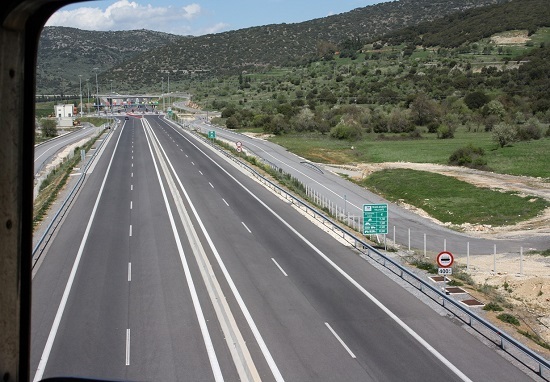 A hugely expensive and hardly used new toll road in the Greek Peloponnese, as seen from a charter train on the Korinthos - Tripolis - Kiparissia line in April 2013, a railway that was modernised with EU money in 2006 but lost all its trains in 2011. No, we are not joking! Public transport disappeared almost overnight, leaving passengers with a choice of the car or staying at home. We wonder how the EC's noble modal shift goals - including a target for rail to account for half of all medium-distance journeys by 2050 - will be achieved if this trend continues? The nature of demand, domestic politics and institutional barriers. Transport is often low on the list of political priorities. Railways come even lower, while there are few votes to be had from improving cross-border railways, where demand is generally lower than on equivalent domestic routes owing to language and cultural barriers. At a time of economic recession, governments tend to look for easy targets for spending cuts, especially when European institutions add to this pressure. In most cases there are genuine additional operating costs associated with international rail routes, while funding/contract mechanisms each side of the border are often incompatible. It is for these reasons that WCN has called for EU funding specifically for the operation of cross-border passenger trains, possibly by means of Public Service Obligation contracts. Disputes between neighbouring countries can also lead to worse cross-border services, something that is clearly not in the broader interest of the 'single market'. Until a few years ago there were direct trains between Szeged (Hungary) and Subotica (Serbia). Each railway then decided to ban the trains of the other country, for reasons that remain unclear. Passengers are now forced to change trains at the extremely basic border station of Horgoš (pictured). Patronage has dwindled to the extent that these elderly railcars can handle the limited traffic that remains. 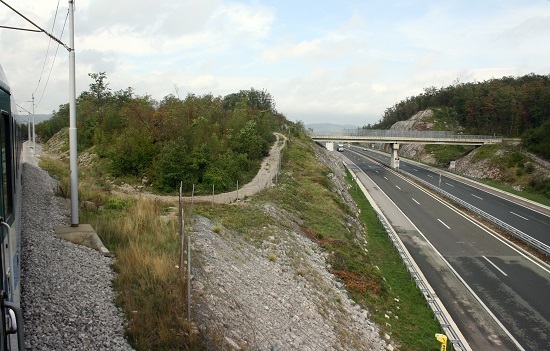 Update: in the wake of Europe's refugee crisis, the route between Röszke and Horgoš was physically severed in September 2015. 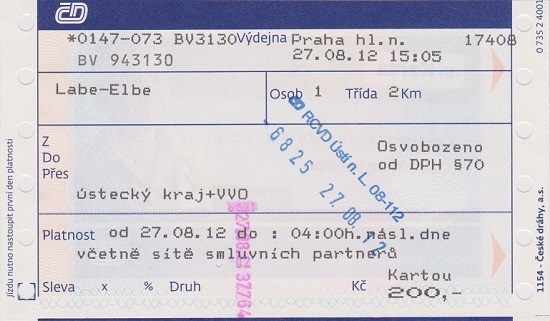 Direct trains were provided between České Budějovice and Vienna until the partially EU-financed electrification of this route on the Czech side was completed. Instead of celebrating this modernisation, we find ourselves wondering why the service has deteriorated. Image courtesy of Al Pulford. Case study: Baltic States: since the end of May 2015 there are almost no international passenger trains within the Baltic States, while the Vilnius - Warsaw train remains "suspended until further notice". An entire region of the EU cut off from central Europe - how did it come to this? It remains to be seen whether the Via Baltica project, predominantly intended as freight corridor, will bring improvements. Estonia - Latvia: weekday engineering works in Latvia between February and May 2015 caused broken connections in Valga on the Tallinn - Riga route, a situation repeated from 1 June 2016. Estonia - Russia: From 15 February 2015 the private Go Rail service of two daily train pairs between Tallinn and St. Petersburg was reduced to two per WEEK. From 12 May 2015 there were no passenger trains at all on this route, with Tallinn - Moscow also withdrawn from 19 May 2015. A daily Tallinn - St. Petersburg - Moscow service operated by Russian Railways then resumed on 10/11 July 2015. More information here. Lithuania - Latvia - Russia: since 31 May 2015 there are no passenger trains between Lithuania and Latvia, following the withdrawal of the Vilnius - St. Petersburg night train. Poland - Lithuania: a new weekends-only service of 1-2 train pairs between Białystok and Mockava was introduced on 17 June 2016. Unfortunately their average speed is just 50 km/h, much slower than competing buses. Management, incentives and conflicts within the rail sector. Although far from perfect by any means, national long-distance rail operators have traditionally cooperated with their neighbours in the areas of timetabling and ticketing, culminating in the EuroCity network that peaked in the early 1990s. This has dwindled in recent years as railways have focussed on their core domestic markets, often in readiness for additional competition from 'open access' operators and/or a desire for profit maximisation. We suspect many railways do not understand the potential size of the market for long-distance international rail travel, which they assume to be too small to be worth developing, despite passengers' increasing desire for a more relaxed and environmentally friendlier alternative to the modern-day air travel experience. Incumbent operators in Italy, Germany and elsewhere have reacted extremely badly to the threat of competition from their neighbours, resulting in the total loss of cooperation (marketing, through/inter-available ticketing between operators, ticket sales, optimal connections, passenger rights, etc.) in some cases. This is very bad news for passengers who - rightly or wrongly - regard 'the railway' as a single system, something that should be hailed as a great strength in comparison with the fragmented aviation and long-distance bus sectors! High track and station access charges have killed off many marginal routes in recent years, despite supposedly being limited by European-level legislation to the recovery of marginal costs. A high-profile example is the excessive cost of infrastructure use in Belgium, which led to the gradual withdrawal of all overnight trains to/from/via the country, the last to survive being the (Paris -) Brussels - Berlin/Hamburg train, binned in December 2008. 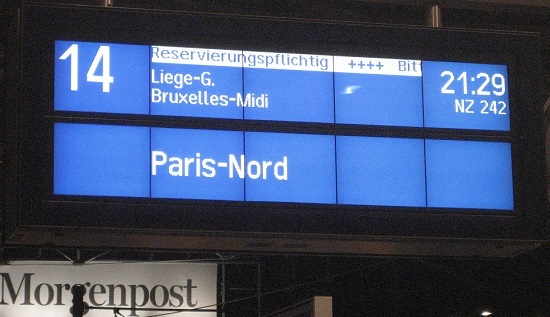 Until their complete withdrawal in December 2014, City Night Line trains from Paris to Germany had to take a much longer route through France, while journeys to/from London took far too long and were more expensive, a double whammy for the poor passenger and highly damaging for the economics of night train operations. High-speed lines have the ability to shrink journey times significantly. But they can also introduce conflicts of interest and reduce choice, especially when the opening of new lines is accompanied by cuts to 'classic' services and international long-distance routes formerly operated under the EuroCity banner. This problem has affected routes to/from France and Belgium in particular, while the journey planner of the former is notorious in being programmed to offer TGVs via Paris when searching for cross-country journeys in southern France! Why is this? Operators want passengers to use high speed trains, in part to justify the construction of new lines and ensure high load factors on trains that are energy-greedy and expensive to operate. However, such trains can make more trips per day than slower trains over the same distance, reducing the number required. Management can be so preoccupied with the most profitable high speed services that classic routes are no longer marketed at best, or suffer 'death by a thousand cuts'. Provincial towns and cities away from the high speed network can be left with a significantly worse service. By removing choice, passengers are forced to go high speed (often at a much higher fare) or find an alternative mode. 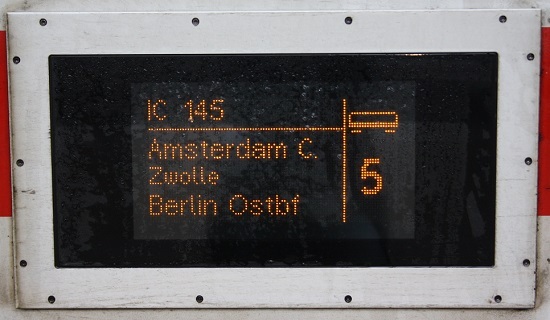 Destination board on a classic EuroCity train from Belgium to Italy. In recent years the route was decelerated and i) cut from 3 train pairs per day to 2; ii) cut back to run north of Zurich/Chur only; iii) cut back to end in Basel eastbound in December 2011; and iv) cut back to start westbound in Basel in December 2013. Comfortable Swiss rolling stock with laptop sockets were replaced by basic Belgian carriages in December 2013. French and Belgian Railways want to force passengers to use expensive TGV trains via Paris (a much longer route subject to global pricing and with awkward cross-Paris transfer). The two remaining Brussels - Basel direct services ran for the last time on 2 April 2016. This has left the Luxembourg - Basel route without direct trains. Operational constraints. Although high-speed lines can permit speeds as high as 320 km/h, time savings are often squandered by the need to change trains in places such as Brussels, Cologne, Frankfurt, Hendaye/Irun and Strasbourg. This is because high-speed trains tend not to be 'interoperable', and classic 200-230 km/h rolling stock is considered too slow for high-speed infrastructure (especially in France). 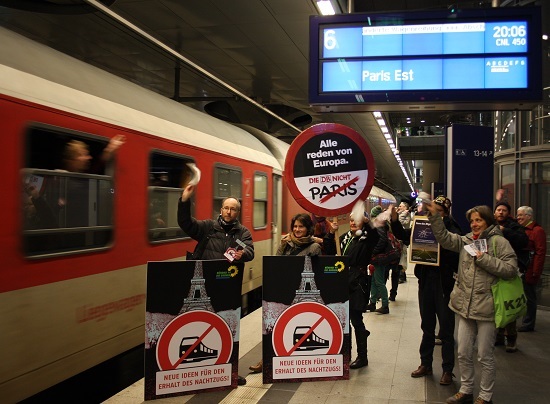 Today there are no direct trains between Paris/Strasbourg and Hamburg, Prague and Vienna. What is the solution? We suggest the integration of timetabling and rolling stock concepts, such that international trains can be operated as extensions of core domestic fast trains and 'foreign' carriages can be used on domestic services, maximising resource efficiency. This is fundamentally incompatible with the current model of each operator specifying its own bespoke rolling stock, exacerbated by a fragmentation-driven increase in the number of players. Cooperation and interoperability the traditional way! This Paris - Vienna day train (and its overnight counterpart) disappeared with the opening of the Ligne à Grand Vitesse (LGV) Est between Paris and Strasbourg. 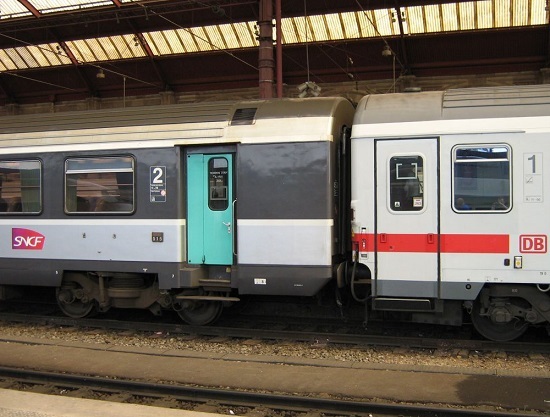 Such trains have fallen out of fashion in western Europe as they are generally limited to 200 km/h and cannot be used on French-style high-speed lines with special signalling, despite the otherwise 'go-anywhere', flexible and low-cost nature of the rolling stock. But many people prefer direct journeys rather than having to change several times and fight with the booking systems of multiple operators. It's not all doom and gloom! Switzerland remains a beacon of sanity: per capita rail use is the highest in Europe despite the wealth of its citizens, near-universal car ownership, an absence of high-speed lines and little liberalisation of passenger services. Switzerland's unwaving political commitment to a sustainable transport system, long-term planning horizons, timetable and capacity optimisation and targeted infrastructure improvements are a model for the rest of the world to copy. 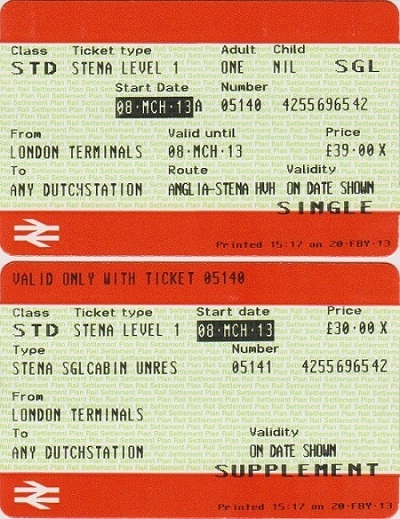 A ticket can be purchased from any public transport stop to any other, regardless of the number of operators used. A ticket valid on all modes for one year can be purchased for around 3000 EUR. Cooperation and integration are at the heart of the Swiss public transport philosophy. While retaining some commercial freedom, Swiss Federal Railways (SBB) has a brief to maximise rail mode share and accessibility to, from and within the country. This is in stark contrast with the narrow aim of profit maximisation on selected corridors seen elsewhere. SBB retains good relations with its neighbours, as there are few if any competition-related conflicts. Local cross-border routes to Austria, Germany and Italy are well integrated into the national system. Elsewhere in Europe regional cross-border routes/networks have been successfully tendered, and a handful of trans-European long-distance routes and ticketing schemes remain. Examples can be found in Appendix III of WCN's open letter to the European Commission. Positive examples do exist! 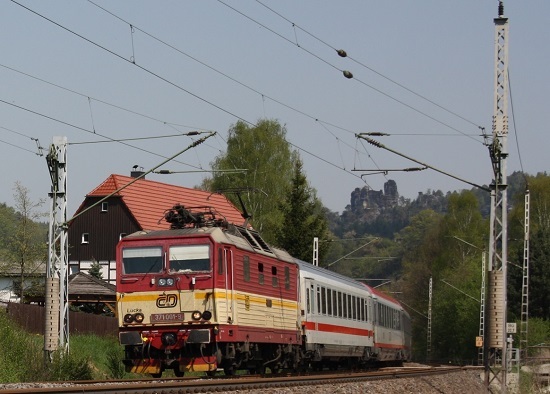 Local authorities in the Germany/Czech Republic border regions in particular have worked hard to offer attractive timetables and integrated ticketing. In this example there is cross-platform interchange and a short wait between a local train from Dresden and a regional cross-border service to Dečin. We welcome competitive tendering for the operation of publically-specified regional routes, provided that the railway still functions as an integrated system. Another survivor and another example of traditional cooperation with interoperable rolling stock! Yes, it takes 7 minutes to change locomotives at the border, but passengers enjoy comfortable and spacious carriages and a reliable service. Why sacrifice that for the sake of 7 minutes? UPDATE: We hear that DB no longer plans to seek authorisation to use its ICx trains in the Netherlands. We hope that comfortable, reliable and flexible EuroCity trains will continue to operate on the Berlin - Amsterdam route. A body at European level (the Commission or its agency ERA) should participate pro-actively in the international timetable negotiation process, acting principally to discourage needlessly poor/broken connections. This is not a technological problem! High track and station access charges are stifling growth and threatening marginal routes. The European Commission should urgently review and mitigate the negative consequences of the requirement for operations and infrastructure management to be separated beyond the level of accounting transparency. Stronger regulation is likely to be necessary. The European Commission and partners such as UIC/CER should disseminate best practice in the financing and operation of international passenger trains, through high-level conferences and publications. The European Commission should support the development of online and printed �Man in Seat 61�-type information resources in all Member States, in order to provide impartial expert advice on international surface travel in an easy-to-understand way. The European Commission and European financial institutions such as the EBRD should consider broad transport mode share and environmental policy goals first and foremost when assessing applications for infrastructure co-funding. Financial institutions' demands for public sector spending cuts must also consider these over-arching long-term objectives. Rules on the use of co-financed infrastructure should be enforced and/or strengthened, such that Member States cannot withdraw (e.g. Greece) or simply not provide (e.g. Danube Bridge 2, etc) passenger rail services on lines recently built/upgraded with European money. Train operators should rethink their strategy in order to attract more business on routes of > 4 hours travel time. Direct trains, optimised connections, through ticketing and good on-board facilities (WiFi, comfortable seating in a variety of business- and group-friendly layouts, catering) can attract and retain passengers. Consideration should be given to retrofitting classic trains with the equipment needed to use high-speed lines at 200-230 km/h. Cramped, poorly connecting and globally-priced trains simply encourage or force long-distance travellers to use alternatives. The European Commission should take the lead in pushing for the implementation of �user pays� and 'polluter pays' principles with regard to road use and flights. The European Commission and both EU and non-EU countries should research, plan and - where necessary - co-finance the operation of cross-border rail routes to fill gaps in the passenger rail network. Public service obligations (PSOs) and competitive tendering are possible solutions. The European Parliament and Commission should prepare legislation to oblige passenger train operators to sell and accept through tickets for journeys involving more than one operator. This might well require the establishment of systems such as the Rail Settlement Plan used in the UK. If this is not possible, the Commission should take the lead in developing/procuring an independent, impartial and free-to-use trans-European booking service. In addition, legislation on passenger rights should be updated to reflect the fragmented nature of the railway in many parts of Europe, in particular journeys made using combinations of two or more tickets. The Commission should take the lead in the development of an integrated, regular-interval long-distance trans-European passenger train network, rather than applying the TEN-T corridor-based approach that is better suited to freight. There should be greater emphasis on planning and funding operations rather than capital expenditure on infrastructure. The 'Mimara' offered a direct and comfortable direct link from Berlin to Zagreb until the year 2000, and was fully integrated into the German InterCity/InterRegio network that has since contracted substantially. Today there is no suitable 'carrier' train for the carriages within Germany. As a consequence you have to change once or twice and journeys are longer despite the use of a shorter, faster route in Germany. Lower image courtesy of Peter Biewald. 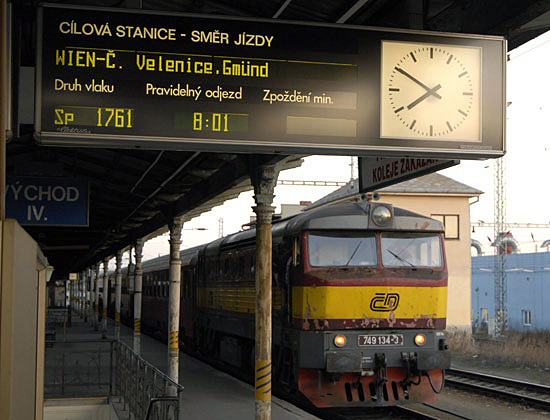 WCN launched an online petition against Croatian Railways in November 2012 in response to its plans to cut almost all international trains. This pressure helped to save 12 out of the 44 daily trains listed for withdrawal. In response WCN has teamed up with Michael Cramer MEP to try to get proper answers out of the European Commission. Why have EU infrastructure funds been repeatedly mis-spent, and why is the EC's rhetoric on seamless mobility (one journey, one ticket, etc) not matched by legislation to preserve through ticketing and passenger rights when using multiple operators? Michael is assisting us by asking questions in the European Parliament. World Carfree Network continues to monitor the situation and will bring you updates here and via the Back on Track mailing list. Services between Wrocław (Poland) and Dresden (Germany) were withdrawn with little warning from 1 March 2015, a victim of a host of financial and organisational problems, leaving the cross-border section over the River Neisse without any passenger trains at all and creating a new gap between the German and Polish passenger networks. Services were restored with a different operator in Poland from 13 December 2015. Questions, comments and your own examples of good and bad practice in cross-border railways are welcomed by e-mail to , WCN's Back on Track Campaign Co-ordinator. You can also join the Back on Track mailing list. The demand for long-distance passenger train services: case study Vindobona - Presentation given by Simon Maarfield at the European Transport Conference (29 September 2015). Possible EuroCity Trains Network - discussion paper published by European Passengers' Federation (March 2015). Missing Links database - an initiative of the Greens in the European Parliament (note it is far from complete). Gaps in the European long-distance rail network - summary of results from the Bachelor thesis of Michael Bienick (15 Mar 2014). 20 Years of EuroCity - A retrospective - the conception, rise and fall of the EuroCity network since 1987 (article in German). Europe has lost its way on cross-border train services - International Rail Journal article of 26 February 2015. Report on the potential of night trains in Germany, commissioned by the German Green Party (9 Dec 2014; only in German). I�m fighting to save night trains � the ticket to my daughter�s future - Guardian opinion piece of 18 Sep 2014. End of the line for Europe's iconic night trains? - Guardian article of 12 Sep 2014. Europe needs a shared vision for overnight trains - International Rail Journal article of 12 August 2014. High Speed Trains are Killing the European Railway Network - Low-Tech Magazine article on the classic line cuts and higher fares that invariably accompany high speed rail projects (17 Dec 2013). Torn between a retro past and an uncertain future: is the sun setting on Romanian rail? - Jon Worth blog article that discusses the future of international trains between Romania and Hungary (8 July 2013). Action needed to save cross-border links - International Rail Journal article of 3 June 2013. Lüttmerding, A. and Gather, M. (2013) Level of service on passenger railway connections between European metropolises. Transport and Spatial Planning Institute, University of Applied Sciences, Erfurt. "With regard to the railway transport policy of the European Union a network approach with focus on connecting the metropolises rather than a continuing definition of corridors, still eminent in the new TEN-T concept, can be recommended." Night Trains 2.0 - UIC study on the feasibility of high speed night trains in Europe (30 April 2013). In summary, the demand is there but track access charges at today's levels render the idea unviable. Are reservation fees and private railways killing the allure of Interrail? - Jon Worth blog article (28 April 2013). Europe's cross-border services in peril - Railway Gazette International article penned by WCN's Back on Track Campaign Coordinator (1 February 2013). Czechs join the Jet set - International Rail Journal article discussing the impact of new entrants on service levels and incumbent operators (14 December 2012). Note that parliamentary questions are generally posed by elected Members of the European Parliament and directed at the European Commission (the EU's unelected executive agency). You can judge the quality of the answers for yourself! Question on rail cuts to/from Greece, put by Michael Cramer MEP on behalf of WCN (11 Apr 2013). Question on proposed line closures in Poland, posed by Michael Cramer MEP and Bogusław Liberadzki MEP (27 Mar 2013). Answer to Question on proposed line closures in Poland (22 May 2013). "Cohesion policy rules require that projects benefitting from European funding should not undergo a substantial modification within five years of their completion. Therefore, closure of lines which have received EU co-financing for modernisation or revitalisation within this timeframe could signify a breach of the rules." Question on the dismantling of rail infrastructure in Greece, posed by Michail Tremopoulos MEP (28 Sep 2010). Answer to previous Question on rail cuts and mis-spending of infrastructure funding in Greece (20 Aug 2010). Question on rail ticketing and travel info, put by Michael Cramer MEP on behalf of WCN (11 Apr 2013). Answer to Question on rail ticketing and travel info (30 May 2013). The message is clear: if you want to retain your passenger rights in the event of delays to journeys involving more than one train, make sure you buy all the tickets in one transaction from the same retailer. But this often isn't possible online or at the station... Our questions about InterRail tickets were not answered at all. The Man In Seat 61 - information on how to travel around Europe and beyond without flying. Taking the train rather than the plane for business travel in Europe: does it work? - Jon Worth blog article (25 July 2013). Cheap rail tickets through Germany - excellent trans-European trip money-saving tips in this Jon Worth blog article (17 August 2012). Europe By Rail - news and articles on European rail travel. DB-HAFAS European rail journey planner - covers most of the continent, but remember to double-check last-minute alterations on the websites of individual operators. ZSR Europe-wide offline journey planner for Windows PCs and laptops - covers most of the continent, but is only available in the Slovak language! Remember to double-check last-minute alterations online. European Commission Directorate General for Mobility and Transport (DG MOVE) - read about the EC's somewhat skewed priorities here (warning: the video really is shockingly bad). The Green TEN-T Website - critical analysis and alternatives to the EC's Trans-European Network (Transport) mega-projects.